How long should you wait for your new teeth? The estimated time of the implantation and healing is 3-6 months or sometimes a year. Your bone structure and the healing period is crucial in determining how long the whole procedure will take. Would you like to find out what happens during the above mentioned period of time or how our implantologists choose the implants that suit you the best? We know that it not too easy to start a treatment especially if you are seeking for the best solution for replacing your missing teeth. We have some good news: you have already taken the first important step by reading our blog. You are probably also aware how important it is to replace your missing teeth and would like to find the best solution possible. If you decide to start the treatment the first question you ace with is the question of time. Is there a need for 3-6 months or a whole year for the treatment and the healing process? Let’s see what it depends on. The implants are stabilized in the bone. In order to maintain a strong connection between the implants and the bone the organism needs around 3-6 months. This process is called osseointegration. After the healing time the implant has to be exposed to physiological pressure. Let’s see what these issues mean in practice. The thickness and structure of the bone determine the type of implants that should be used by the implantologist. The whole healing process are based on these issues. If you have sufficient bone for implants the implantologist will choose conventional implants. In this case there is no need to strengthen the bone in advance, so implants can be inserted immediately. Following treatment 3-6 months are required for the bone and implants to fuse properly and ensure a stable connection that makes fitting a crown possible. This is the case when 3-6 months are needed for the process. If you have a mild bone recession the implantologist will strengthen the area that needs to be implanted before inserting the a conventional implant. This process is called a bone graft or a sinus lift - depending on which area has to be implanted. You can read more about bone replacement here. When the bone is strong enough to hold an implant the implantologist inserts it. After this process 3-6 months are needed for a stable connection between the bone and the implant. This is the case when a whole year is needed for the process. If you have severe bone loss and a long time has passed since you lost your teeth conventional implantation is not possible anymore even with bone replacement. Most of these patients were refused to receive implants. The only option was wearing dentures. Today it is possible to have the missing teeth replaced by implants thanks to the revolutionary implants. These Bi-cortical implants are formed in a way that they are stabilized in two hard layers of thee bone instead of one. Due to its flexible form the sinus area can be avoided. The implants can already have pressure on them and there is no need for a 3-6 month bone replacement process or fusing time (3-6 months again). You can find out more about the Bi-cortical system here. One of the most important factors of osseointegration is using implant with bionaire surface.The implantologists working with us use the implants with high of quality, made of unalloyed titanium. Titanium is the kind of material that the organism can fully absorb and there is no chance for an allergic reaction. 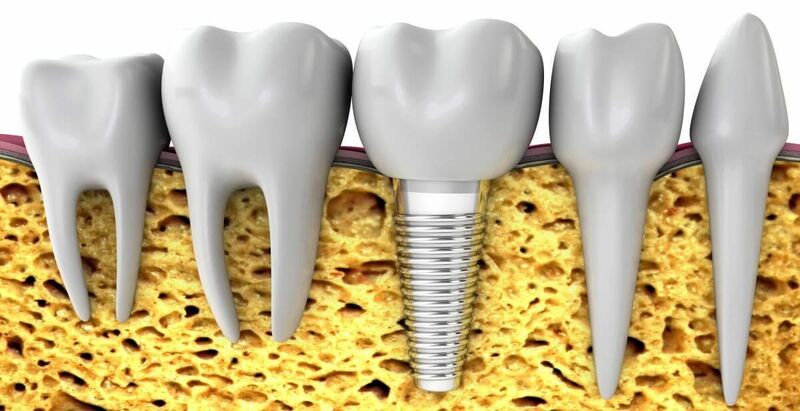 Thanks to the screw thread and the porous surface of the implants osseointegration is easy and efficient. The bone can connect more easily to the porous surface that grows by the screw thread. The process of implantation in a simplified version is the following: The dentist then opens the gum where the tooth loss occurred making the bone available for implantation. The next step is determining the place, length and direction of the implant with a special drill. After that the dentist makes a hole in the bone that suits the implant perfectly. The next steps are inserting the implant, closing it with a so-called healing screw and stitching the gum. After the treatment a healing period of 3-6 months starts during which the natural bone has a stable connection with the implant. In dentistry it is called osseointegration. The implant is safe in the parodontium during this time. This is the time of the rest of the tissues. In order to maintain the health of your bone physiological pressure is very important. In the case of the natural teeth the chewing pressure goes through the crown , along the tooth root to the bone. In the case of implants these roles are the responsibility of the crown, abutment and the implant itself. If there won’t be enough pressure on the bone, the process of bone recession would start again.